Skeleton map of the State of California. Map 588, California Historical Society. 1. A rare early map is Ransom Leander’s A Skeleton Map of the State of California: Exhibiting the U.S. Township and Range Lines and Boundaries of U.S. Land Districts, the County Seats and the Lines of Equal Variations of the Compass. It was compiled for the California Academy of Natural Sciences, probably in 1853. Ransom came to California in 1851 as U.S. Deputy Surveyor General for California and in that year established the Mount Diablo Base and Meridian lines (the initial points for surveying public lands in most of California and all of Nevada). 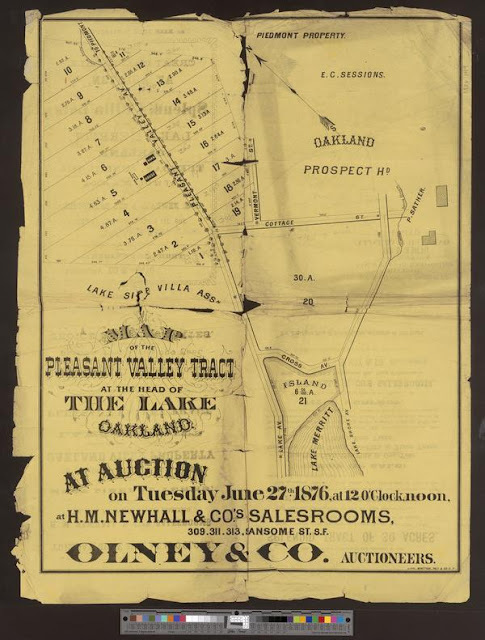 Map of the Pleasant Valley Tract at the head of the lake, Oakland [recto]. Map 149, California Historical Society. 2. A typical nineteenth-century real estate subdivision is depicted in the 1876 Map of the Pleasant Valley Tract at the Head of the Lake, Oakland. The map announces the auction of “splendid villa lots” at auction by Olney & Co. at the offices of H.M. Newhall & Co. It shows lot numbers with dimensions and building footprints. Henry Mayo Newhall opened his successful auction house in 1850 upon arriving in San Francisco. He later branched into railroads (President of the San Francisco and San Jose Rail Road), real estate, and ranching, purchasing several Mexican land grants in Monterey and Santa Barbara counties. Perhaps his most important acquisition was the Rancho San Francisco in the Santa Clarita Valley in northern Los Angeles County, which became known as the Newhall Ranch. His heirs incorporated the Newhall Land and Farming Company and founded the Henry Mayo Newhall Foundation. The Digital Library contains maps of tracts in Los Angeles, Oakland, Berkeley, and San Francisco. 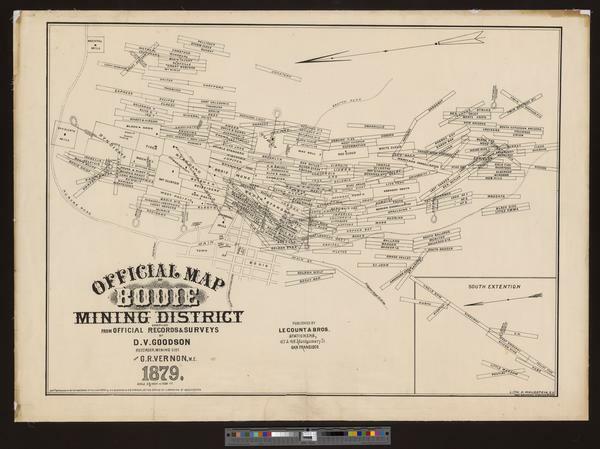 Official map of Bodie Mining District. 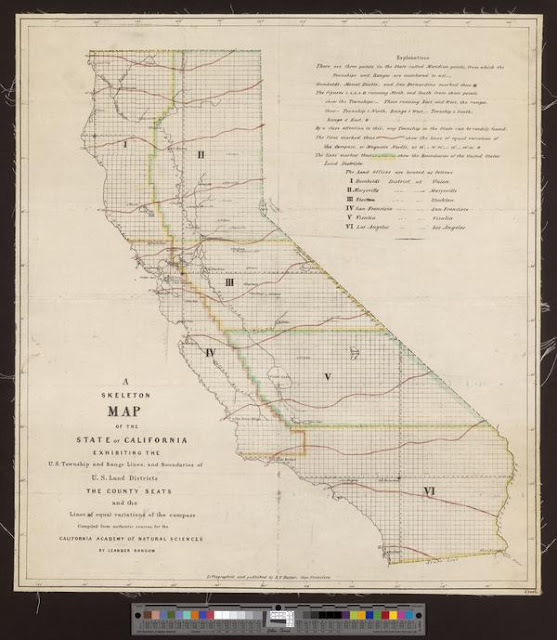 Map 490, California Historical Society. 3. Tagliabue & Garrard’s Map of Bodie Mining District, Mono Co., Cal., dating from the 1860s, shows the townsite of Bodie as well as claim boundaries, mining tunnels, and tramways and has two views of mills. The map was printed in San Francisco by Grafton T. Brown, the country’s first African American lithographer. Brown was also an important map maker and artist. The Digital Library includes several other examples of his work. 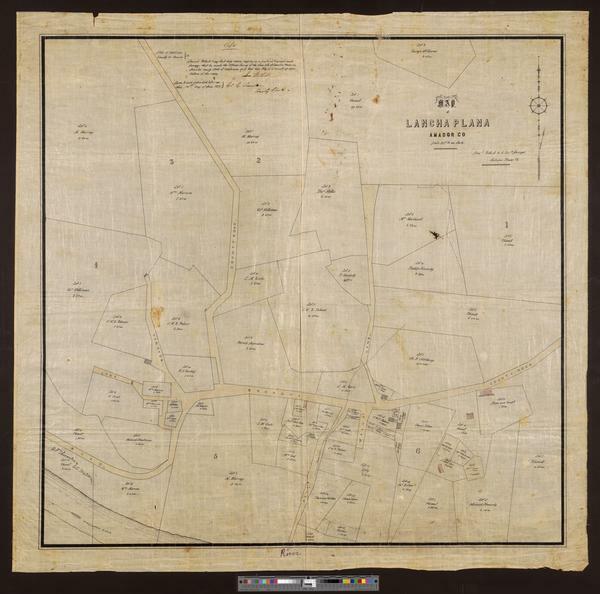 Map of Lancha Plana, Amador Co.
Map 142, California Historical Society. 4. The pen-and-ink and watercolor Map of Lancha Plana, Amador Co. (1871) shows buildings, landowners, Chinatown, and a Chinese garden in this former southern mines gold rush community. The map was drawn by U.S. Deputy Surveyor Samuel Bethell. The town, on the north bank of the Mokelumne River, was founded in 1848 as Sonora Bar and eventually grew to about 1,000 inhabitants. It was later renamed after the flat-bottomed boat used to ferry people and goods across the river. Since the 1960s, the remains of Lancha Plana have been at the bottom of Camanche Reservoir. 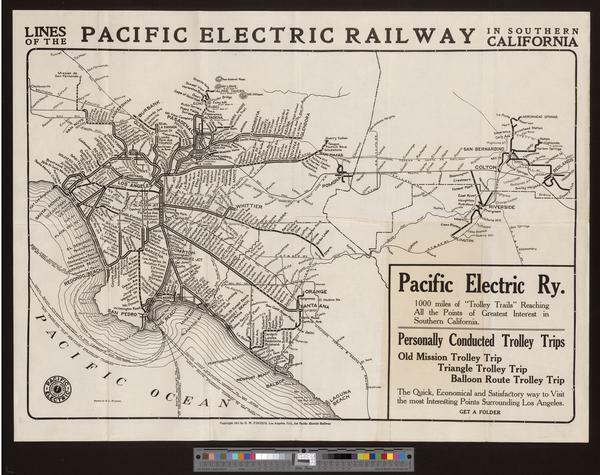 Lines of the Pacific Electric Railway in Southern California. Map 627, California Historical Society. 5. The 1911 Lines of the Pacific Electric Railway in Southern California includes connecting rail and steamship lines of the Los Angeles area’s early commuter network. The “Red Car” system was the largest operator of interurban electric railway passenger service in the world, with more than 2,000 daily trains in the 1920s. It ceased operations in 1950. 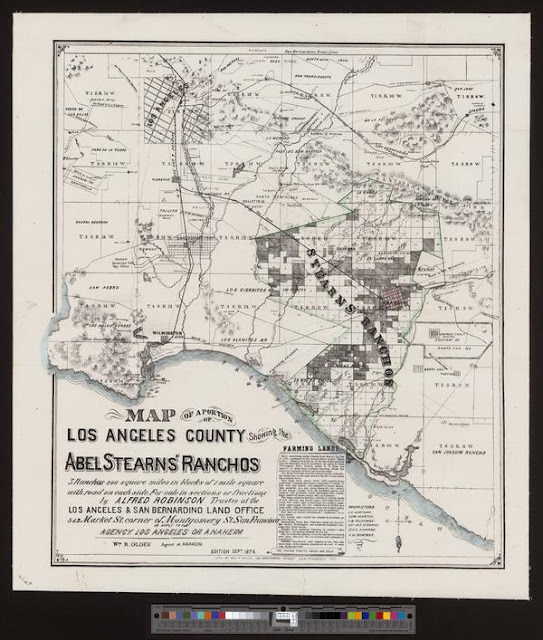 Map of a portion of Los Angeles County showing the Abel Stearns' Ranchos. Map 611, California Historical Society. 6. The hand-colored Map of a Portion of Los Angeles County Showing the Abel Stearns' Ranchos was issued in 1874. It shows rivers, land ownership, settlements, railroads, and lands for sale in Orange and part of Los Angeles counties. Abel Stearns (1798–1871) became a major Southern California landowner and cattle rancher. Financial reverses caused by a severe drought forced to him to sell many of his properties. Funding to scan and make these maps digitally available was generously provided by the Henry Mayo Newhall Foundation and David Rumsey. The high-resolution scanning and processing was done by Luna Imaging, Inc.
University Libraries, and the David Rumsey Collection. The California Historical Society, founded in 1871, is a nonprofit organization with a mission to inspire and empower people to make California's richly diverse past a meaningful part of their contemporary lives. © Copyright 2012 California Historical Society. Picture Window theme. Powered by Blogger.